The main floor of this 3 bedroom Villa has a small bedroom with private bath that would be perfect as a visitor’s room. It is right beside the living room, kitchen and dining area. Opening to a covered terrace beside the pool area. On the upper level a huge rap around terrace surrounds the master bedroom with walk-in cedar closet and private bathroom. There is another bedroom with private bathroom and small terrace. A third terrace is available for everyone to enjoy. This offer includes: Construction of the villa, landscaping, & fully planted garden, fans in the living area and every bedroom, AC in the master bedroom, generator, stove and hood fan. 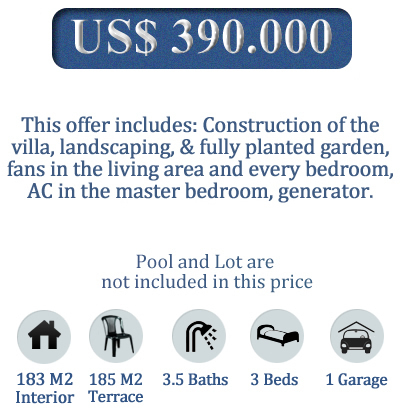 This offer not includes: Pool and Lot are not included in this price ! !